Imagine waking up in the morning and starting to read an article on your smartphone, but then moving into the kitchen and being able to continue reading it on your refrigerator, before you get into your car to drive to work while listening to the news. And this experience would happen seamlessly, without much effort on your part. 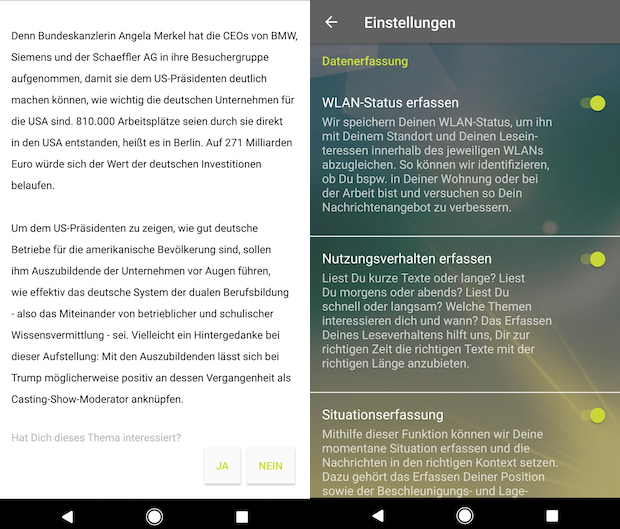 In 2016, German organisation OpenDataCity received funding from Google's Digital News Initiative to explore sensor journalism and how data about a person's movements, or information such as whether they are scrolling through their smartphone using mobile data or a known Wi-Fi network, can provide context-aware news. For the last six months, a team of 10 people headed by Marco Maas, managing director of OpenDataCity, has been developing an app called xMinutes, which is currently in beta on Android. It is being used by around 37 German publishers, including Deutsche Welle, Der Spiegel and Tagesschau. 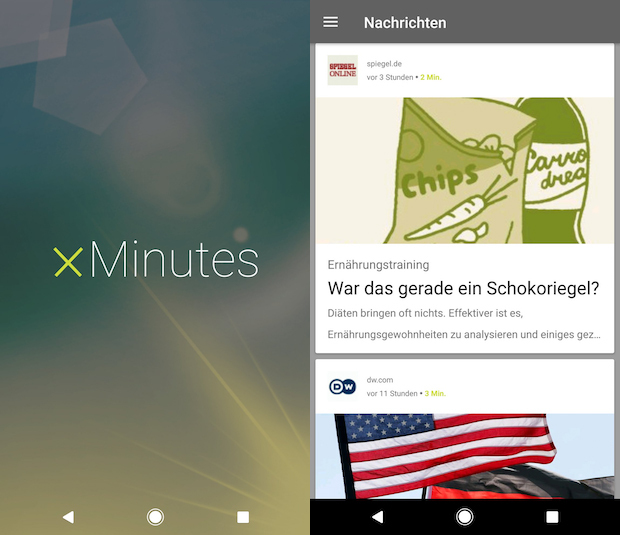 XMinutes imports content from publishers using RSS, JSON or an API, and presents readers with a feed of between five and 25 articles that "should fit the needs of your news consumption", Maas told Journalism.co.uk. "We estimate that you don't have a lot of time given the typical schedule of your day, so we can start off by only giving you short articles to give you an overview of the news, and after that we try to give you longer reads from other publishers throughout the day. "We need the user to read about 100 news items throughout the day to estimate what their typical day is like: do they like to read long stories after waking up or do they prefer to do that on their commute to work?" The app analyses content in a semantic and structural way to establish whether it's a written piece, an audio snippet or a video. It also looks at how long a piece is, how long it would take an average person to read it and how long it would take someone who is not fluent in German to finish. XMinutes is then able to determine the best match by analysing a user's behaviour and data from movement and internet sensors. For example, if your smartphone is moving or if you are using a new Wi-Fi network, it might mean that you are running or that you are in a public place, so your needs would be different to when you are the office or at home. "We track your movement, so if you're walking, driving or riding a bike, and we also track your location. If you spend the whole night there, we assume the context is your home, or if you are there for the whole day and you were somewhere else in the morning, we assume this might be your place of work and so on. "We already know that the weekend is a special case because people don't do the same things at the weekend and they're not in the same places all the time, and that's why we need to user test the product to create a good flow." Maas said they are getting ready to test the beta version of the Android app with readers this month, with an iOS version currently under development and scheduled for release in May. A new user of the app will have to go through a short onboarding process, providing information about their place of birth, the cities they are interested in receiving news from, and whether they have a strong interest in politics, economics or other topics. After this initial step, the news streams are tailored entirely based on sensor data and user behaviour. "The most interesting things we can't find out by ourselves is where you were born and what places and cities you're interested in. "One thing I would like to implement in the future is to give local publishers an idea of how many people are abroad or outside a city that are still interested in what is going on in that particular place, so that the publisher can decide what kind of news from that local area could be interesting for expats." Some aspects of the development process have proven challenging, such as repeating content if publishers repackage stories obtained from news wires, and the participating outlets' ability to geotag their material. The team decided to exclude stories from the DPA (German Press Agency), whose content was originally included, because of repetition. "We thought that if it's a national piece of news, Der Spiegel or Tagesschau would be the first to report it and local and regional publishers would cover it with a local angle a bit later." "Right now we are trying to figure out how we can distinguish an article that is based on DPA material but not as much that you would be bothered to read it again, because there is still original news in there that hasn't been reported yet." Geolocated content has been an issue, as the team has to estimate where a story is taking place. For example, Maas said, all of Frankfurter Allgemeine Zeitung's (FAZ) articles are geotagged as Frankfurt, and in some cases there could be more than one town with the same name in the country. "We are thinking about a model where we try to understand the region better, so for example we know that someone publishes in northern Germany so we create entities for every single city there. "We would try to create a model that is extremely specific for every single place that we are covering, so you can check it against an article and be able to determine which Hamburg is now the topic of news." 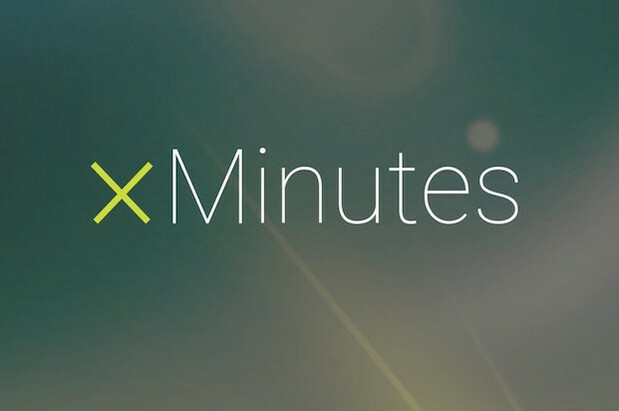 XMinutes is currently free for all users and participating publishers, who get insights about people's reading habits. The company is hoping to implement a subscription model similar to Spotify in the future. "My spin here would be to talk to the big telecom or electricity providers to charge users on a monthly basis. If we could get €2 or €3 per month for the service, we could share that with the publishers and now that we have the app in beta, this is something I will be focusing on."